When she was younger, SCOUT was a side character on magical girl team. Today she’s a personal trainer at Glittergym: the most POWERFUL GYM IN THE LAND, or it will be once they can get ahead on their business loan payments. As the only bruiser on a team of skinny, agile magical girls, young Scout was most often used for comic relief. She never even got her own episode. After her team was cancelled halfway through the second season, she quit the magical girl life, and entered the world of personal fitness. She draws her powers from four magical gemstones. They include super strength, a ten-thousand-pound-punch, and the ability to teleport her morning coffee directly into her hand. Recently she’s been trying to cut back, so these days all she summons is tea. The spunky and heroic BORIS wants nothing more that to be on a magical girl team, but after countless tryouts and auditions, she hasn’t gotten a single callback. So, determined to train with a magical girl, Boris seeks out Scout. She finds her at Glittergym: the most POWERFUL GYM IN THE LAND once they fix the water damage on the second floor. Boris draws her power from the stripes on her tracksuit. She bounces back from injuries very quickly and gravity has very little effect on her. If she were pushed off a building, she would float gently to the ground like a feather. Boris hasn’t been able to find a team for two reasons: Firstly, her weightlessness means she can’t really hurt anyone, so she isn’t very useful in a fight. Secondly, her capacity for friendship, love, and encouragement is exceeded by her bad attitude. 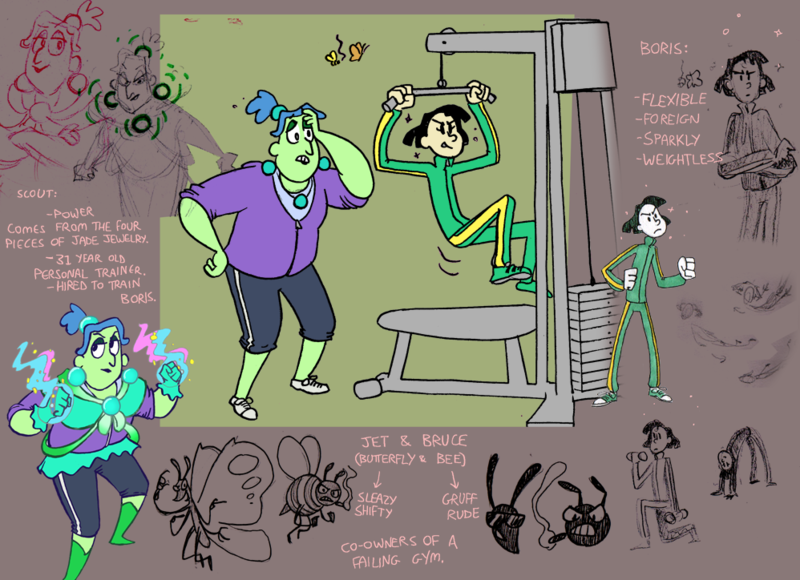 JET THE BUTTERFLY and BRUCE THE BEE are the owners of Glittergym, which will be the most POWERFUL GYM IN THE LAND as soon as they can pay off the treadmills. JET is a sleazy business executive who definitely wasn’t fired from his job at the record company and definitely just decided to try his hand at gym management because it was time for a change of pace. He’s always got some absurd spin on a bad situation. If the roof collapsed, he’d advertise their new skylight and raise membership prices. To help him manage the athletes, Jet turns to BRUCE, a leathery old coach who’s famous for leading the 1987 Peoria high school swim team to a stunning fifth-place finish at state finals. Bruce spits underhanded encouragements past his cigar and claims to have no idea what a magical girl is. But secretly he’s got hundreds of season DVDs stashed under the floorboards for when he gets sad.